Make sure to be on the lookout for this month’s issue of Today’s Charlotte Woman magazine. 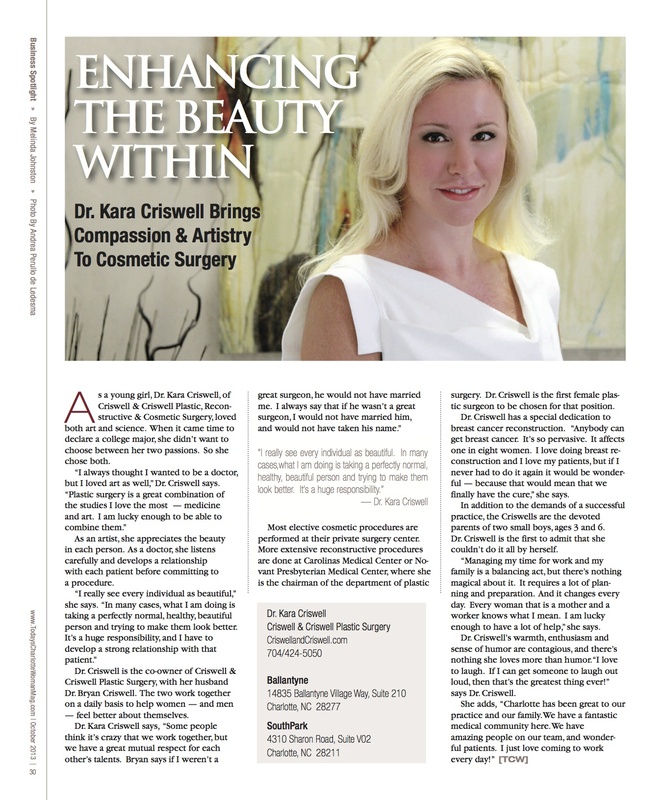 Our very own Dr. Kara Criswell is featured in this month’s issue for her achievements in Plastic Surgery in the Charlotte area, as well as her ongoing support of breast cancer awareness. Dr. Kara Criswell has been a advocate for helping patients all over who have been afflicted with breast cancer, by recognizing the importance of offering reconstructive options to patients. There are many reasons that women may desire and need reconstruction. Whether the cause of the deficit is congenital, such as Poland’s Syndrome, or the result of a mastectomy after breast cancer, breast reconstruction surgery is a wonderful option for women. Check out this article and learn more about Dr. Kara Criswell, her day-to-day life, and how she came in to the field of plastic surgery. Also, be sure to come visit either one of our offices at SouthPark or Ballantyne Village. For more information about Dr. Bryan Criswell and Dr. Kara Criswell, and Criswell and Criswell Plastic Surgery please visit: https://www.criswellandcriswell.com/blog/.